I am trying to implement a project using xCP Designer. I am creating a form and want to perform some operations using a button. What version of xcp are you using? I believe this has been implemented 2.3 on later patch. In 2.3.0 you have the option to press "ctrl+enter" to trigger an action. in a later patch they changed it to just "enter". Don't know the patch version any more. It is not triggered on default, I guess. In my project, when I press "ctrl+enter" the button did not triggered. Is there a function to add to its behavior? How can I add that trigger? Yes, you will have to create an UI Event to be fired when user clicks ctrl+enter. 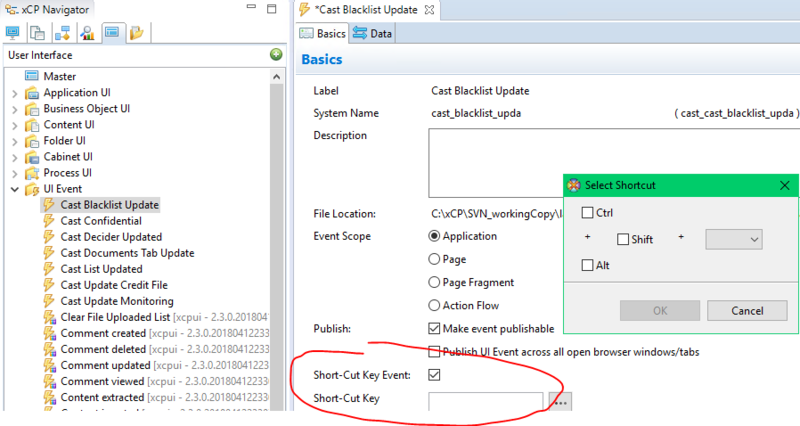 When you create a new UI Event, you can configure the shortcut-keys. Then use this UI Event to trigger any action on your page.